Reciprocating compressors offer efficient and flexible operation. 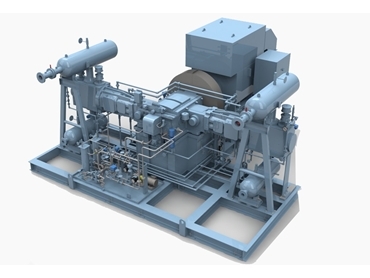 Reciprocating compressors offer efficient and flexible operation. They are vital compressors in various process units. In this article, advanced control technologies, new innovations and latest configurations regarding condition monitoring, performance, flow management, capacity control systems, operational flexibility, cylinder valve, irregularity control, vibration control and other important control/automation subjects related to reciprocating compressors are presented. Amin Almasi writes. The reciprocating compressors (known also as “piston-type” compressors) are the best compressors for any service that the capacity is relatively low and the differential pressure is relatively high. Maintenance costs of reciprocating compressors are approximately 2-3 times greater than those for centrifugal compressors. This shows the importance of proper condition monitoring and automation for the reciprocating compressors. Cylinder valves are the most critical components of reciprocating compressors and strongly influence reliability, operation, performance and efficiency of these machines. Cylinder valve defects are obviously responsible for most of unscheduled maintenance events of reciprocating compressors. Valve components should be operated (opened and closed) several billions of times during their operating life without being affected by fatigue or other degradation mechanisms. The correct material selection and proper component design are keys to achieve a successful valve operation. Reciprocating compressor valves should be supplied from a reputable valve manufacturer with proper references and a long-term successful production history. Some compressor manufacturers are also active in the cylinder valve business. Usually, cylinder valves manufactured by compressor vendors should be dealt with great care. The valve design and manufacturing should be considered as very delicate tasks. This is only performed successfully by a few professional manufacturers. Sometimes, for special applications, there are only three qualified cylinder valve suppliers with satisfactory references. Advanced polymers have excellent mechanical properties and are capable of working at hostile cylinder valve conditions which also include extreme mechanical stresses and relatively high temperatures. In most cases, modern, sophisticated, low mass polymer sealing elements can vastly increase the valve life (could reduce energy consumptions and maintenance costs). The main advantages of modern polymers over old-fashion metallic valve parts are: improved heat resistance, high fatigue life, high tolerance to dirt and corrosive traces (liquids or chemicals) particularly those in dirty gases, reduced wear and improved sealing capabilities. For large compressors (generally low speeds and high pressure ratios) and small machines (relatively high speeds) the “ring type valve” and the “plate type valve” are the best option, respectively. The best valve size should be selected with respect to efficiency, reliability and performance requirements considering many operational and machine design factors such as the minimum clearance volume. The valve “lift” is the distance travelled by valve moving elements. The higher the lift, the higher the valve flow area, the lower the valve pressure drop, the less consumed power, the higher moving elements impact velocities and the lower valve durability. An optimum valve size and an acceptable valve lift should be found for each application. The optimum valve spring stiffness is also important. Too stiff springs can lead to the valve flutter (more compressor power and considerable wear rate) or early closing of valve (reduce the capacity). Too light springs cause valve late closing and the reverse flow (higher velocity, less reliability and reduced capacity). Traditionally, “poppet valves” were popular many years ago. Previous generations of poppet valves have left service because of poor performance, low reliability and operational problems. Today, some compressor manufacturers offer new versions of specially-designed poppet valves with great promises. The performance and long-term references of these valves should be considered carefully. Sophisticated evaluations are required to highlighting clearly advantages and disadvantages compared to commonly-used valves (such as the “ring type valve”) for each application.